Worldwide increasing energy demands have led to a growing interest of large-diameter pipe producers to develop gas fields in hostile environments such as permafrost areas. Excellent low-temperature toughness of the pipe material is a pre-condition for the use of high-strength line pipe grades which also offer the advantage of a reduced wall thickness at a given operating pressure. Modern high-strength heavy plates used in the production of UOE pipes are produced by thermomechanical rolling followed by accelerated cooling (TMCP). Their bainitic microstructure yields the potential to combine high strength and high toughness provided that the processing parameters are optimized for the individual requirements. For this reason, Salzgitter Mannesmann Forschung (SZMF) in collaboration with Salzgitter Mannesmann Grobblech (SMGB) investigates the relationship between rolling and cooling parameters of heavy plate production, microstructure and low-temperature toughness. The basis of a scientific approach to metallurgical challenges is the correlation of alloying concepts, processing parameters, microstructure and mechanical properties. It is a truth universally acknowledged that a variation of the process parameters has an immediate impact on the microstructure which correlates with mechanical properties. However, microstructure characterization tools as well as mechanical testing methods have to match the range of the underlying physical phenomena. Advanced characterization methods such as scanning electron microscopy in combination with electron backscatter diffraction have broadened our understanding of the metallurgical mechanisms and have helped to define processing conditions to produce heavy plates with optimized low-temperature toughness. The present paper presents recent results of a laboratory investigation of the effect of pre-straining of Charpy specimens on the microstructure and low-temperature toughness of grade X80 heavy plate material. The plates were processed in a laboratory rolling mill with different final rolling temperatures above the onset of the ferrite-austenite transformation and cooling stop temperatures above the martensite start temperature. Scanning electron microscopy and electron backscatter diffraction were used to characterize the microstructure of the plates. 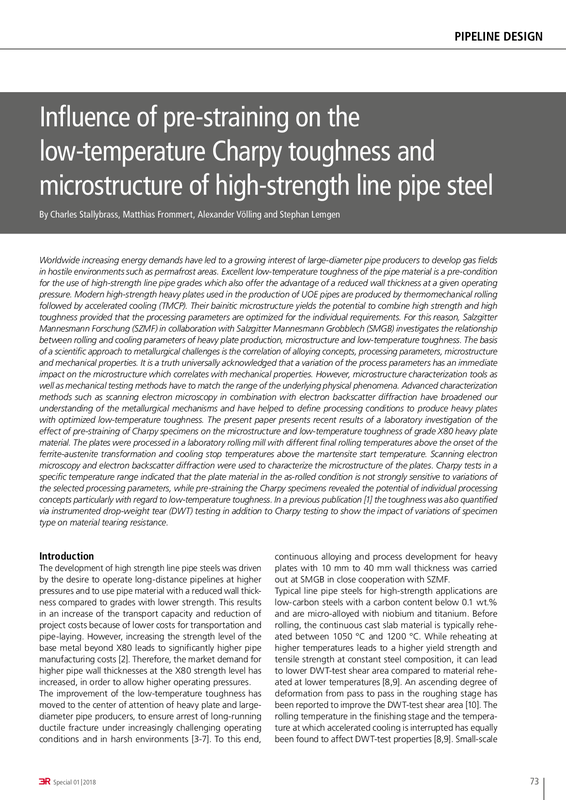 Charpy tests in a specific temperature range indicated that the plate material in the as-rolled condition is not strongly sensitive to variations of the selected processing parameters, while pre-straining the Charpy specimens revealed the potential of individual processing concepts particularly with regard to low-temperature toughness. In a previous publication  the toughness was also quantified via instrumented drop-weight tear (DWT) testing in addition to Charpy testing to show the impact of variations of specimen type on material tearing resistance.